Yesterday on his blog, AVC, co-founder of Union Square Ventures Fred Wilson weighed in on the most recent Uber scandal with some pointed and insightful remarks on why the startup poster child keeps generating negative press at every turn. “Values and culture matter more than anything. They seep into the product, the user experience, the brand, and ultimately define the company in the market. And all of this comes from the top,” Wilson wrote. It’s a truth supported by gyro’s recent study Only Human – that so called “soft factors” matter a lot when it comes to business success. While a majority of executives surveyed by gyro and FORTUNE recognized the impact culture and corporate values have on concrete business results, when push comes to shove, some businesses fall into the trap of putting hard, measurable factors first – victim to the “ruthless capitalist” mythos. Uber’s case is a particularly good example of how, even when you win in all the quantifiable ways, ignoring values is a bad long-term strategy that destroys trust, promotes a company environment rife with misbehavior, and ultimately costs you in cold hard cash. As Wilson puts it, you can have the “best execution” ever, but without values, the future is bleak. Value (speed and cost) – on price and efficiency, Uber wins over the entrenched taxi systems in most markets. Coupled with the “on demand” features, it’s arguably a great value in terms of dollars. Values – On many occasions, Uber has revealed itself as a company run by foible-less leaders – whether by outright threats, dirty competitive tactics, disregard for privacy policies, or questionable employment practices. Whatever CEO Travis Kalanick might say, the only “values and ideals” the company seems to consistently reward are a “win at any cost” mentality and widespread rule breaking (a precedent set by the firm’s famous regulations-be-damned rollout). Network power/competitive advantage – Uber might be more convenient and available to consumers than any other car service. …but the “how” matters. Tactics employed to gain market share – such as booking and cancelling competitor Lyft’s services to sabotage their business, poaching drivers from competitors, etc. – leave a bad taste behind. All the right paid partnerships and PR – from Uber Kittens to Uber and Spotify – the company executes trendy, well-designed campaigns to raise awareness. On the flip side, its shadier practices have garnered it loads of negative, unpaid press coverage. 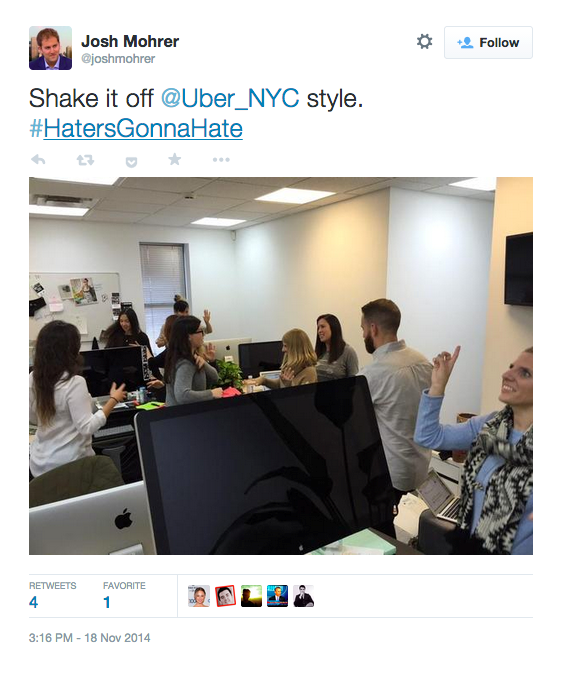 Instead of taking this in stride, Uber leadership took it as an invitation to target journalists with smear tactics. Profitability and growth – Despite questions about the justification of its $18 billion valuation, the company shows significant signs of growth and investors are confident in its future. …but some argue that the company’s treatment of drivers and pricing model (surge pricing) will alienate the core constituents of its value chain – drivers and customers – because they destroy trust. It remains to be seen how soon this behavior will catch up with the startup – but gyro’s research indicates that, in the long term, you can’t win without trust and a culture built on strong values and respect.